Tracking clicks on Facebook: the scams, the apps and whether we want it? It’s the sort of app that everyone wants but fears and knows would ruin social networking. Something that lets you track who looks at your page and how often they click on it. These apps pop up from time to time and run until Facebook find out about them and squash them. 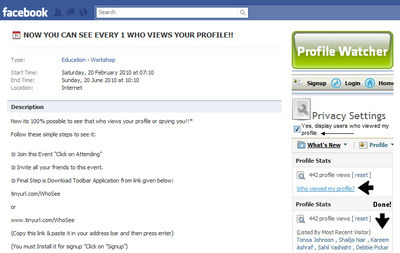 I was sent one disguised as an event recently: the informatively-named – “NOW YOU CAN SEE EVERY 1 WHO VIEWS YOUR PROFILE! !” The gist is that you visit: “www.tinyurl.com/whosee” and download what looks like a Mozilla Firefox extension called the Feboz Social Networking Toolbar (also works for IE and Safari). The event structure and the “invite all your friends” command just ensures the viral spread of the app. They claim here that “now it’s 100% possible to see that views your profile or spying on you”. Anyone know anything about Feboz? only contact details are a query form, I’ll let you know if I hear anything back [UPDATE BELOW]. They have a page on Facebook which claims they have 152,291 registered users and let you track your visitors. Until we hear something back we can safely assume it’s either a scam of some sort or not doing what the text below promises. 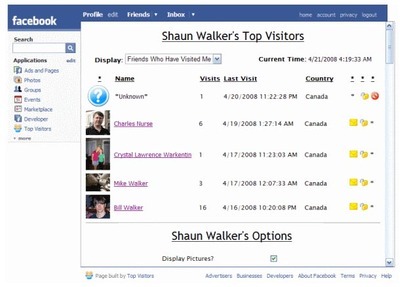 Now defunct Facebook app Top Visitors was a less dodgy version of a clicktracker – it logged how often your Profile page was looked at and by whom. The app also uploaded a hit counter to your Profile page and displayed information about each visitor including how often they have visited, when they last visited, and where they are currently located. Facebook had set up technical blockades to prevent this, but the developer Shaun Walkers found a loophole in the Facebook code which let him insert a tracker in. He explains how he did that in a blog post here. The loophole is now closed and the app doesn’t work, but it is interesting how popular it was: getting 10,000 users in two weeks. The only authorised example of click-tracking on Facebook can be seen on Facebook fan pages where you can see who’s been looking at and interacting with your fan page by age-range and gender. It’s pretty interesting, but it’s not personal. Are you sold? What do you think? Dear Anna. Toolbar is used for Signup. And there is an apps which works with Feboz. You can see who views your Feboz Profile on Feboz. its not related or Part of Facebook. Dear Anna. We check and got many complaints about the Events. Those Events are not Created or promoted by Feboz. There are few people who try to get points from those events. And as you talk about picture I just check them they didn’t said that you can see who views your FACEBOOK* Profile. The word Facebook is not used in that event. But again let us clear that those events are not created or promoted by Feboz. and Toolbar is only for Feboz. like you can use feboz from your feboz toolbar. Its easy to use and always in your explorer. it is interesting how popular it was: getting 10,000 users in two weeks. Indeed facebook is very hot now,and soon will the king of the net,if it is not already. People are worried about privacy on Face-book.I am also concerned about my information privacy..
so even if the technology exist it is not easily available.there are some working scripts which actually work but if ur a rookie at it u should probably not try bcus scripting is also a vry used tool for hacking ,so best is u keep away for ur own safety!! Ask yourself this… what’s in it for them? Do you really think they just made Feboz for the fun of it? Do you think they spend tons of money running the site or doing code updates because they just love to blow money? If you think Feboz actually did this out of the goodness of their heart then please return to your village, they’re missing you. Of course it is going to redirect you, monitor you, slow your computer down, load more and more junk you don’t want onto your hard drive and eat resources, eventually gain more info on you that you want them to know and most importantly it provides another “back door” into your computer for hackers. Sooner or later you will have your identity or credit card info stolen if you keep downloading “Free” app’s. Apps like these are gonna kill Facebook. Why God! Why?! What’s with the stupid event update anyway? Their claim, that Feboz has nothing to do with it, is absurd. I can’t wait for Facebook to get rid of these morons. @Brittney – The thing is obviously a scam and is clearly designed to sucker people in to thinking that whatever is installed will allow them to see who views their profile. Your scan may not have revealed anything for several reasons. For one, an installed toolbar doesn’t often show up as anything malicious. It may sit there dumping seemingly harmless advertisements on you or managing redirects or simply tracking your activity (things you don’t even really notice or think are part of the page you navigate to). Many tool bars do this kind of thing and some will eventually navigate to a site that *does* put something on your system. You ran a scan with what? If you’re lucky (considering this is fairly new) Malwarebytes or Spybot SD will detect something. Also, did you run a simple process monitor to see if there are any unidentified processed running on your computer? You don’t have to take my advice but I’ve been browsing the web since Mosaic was new…I’ve rarely seen a browser toolbar that wasn’t either malicious or a burden. I would disable/remove it if I were you. Who ever is looking is who ever is looking; what are you going to do about it? it would be great to know those persons who viewed my profile…. it wud be very nice if i will be able able to see who views my profile coz it will me know who’s interested of knowing me. People are worried about privacy on Face-book. Its a little late for that. As with anything we have less control over our personal info than we would like to think. Once you hit that send button your done. People don’t want to face it, but its true. I would like to know who is looking at my profile and would check it daily. Although a lot of the info contained in my profile is set to Only Me, or Friends, it’s on the internet. Once its on it, it aint commen off people. If you think that hitten the delete button does it, you better check some of the old sites you have visited in the past and deactivated accounts or deleted profiles. It’s still there. Sometimes after years. If you don’t want people knowing or seeing then don’t put on the computer!!! DON’T KID YOUR SELVES! I think if you dont want to be seen on facebook dont let your profile go public but Im not sure if I want to know who is looking at me…..
@Michelle – agh that’s the problem, it would make facebook even more addictive. sometimes though you want to know, it’s best not to, right? Hi Anna, Nice post, I read it and also joined this event. as you can see the reply from feboz I do agree with it. If we only talk about this feboz case, I think there is clearly mentioned that this is for feboz only. I have joined many of other group & events like this and they claim profile view on facebook. In your post, in that event you can see they used * and in the end they explain it.. *It works with feboz only. Thanks for awarness. Wrong. “Clearly mentioned” would be if “it works with feboz only” was written as part of the sentence, rather than qualified by an asterisk at the very bottom of the page. There is not one single, beneficial reason to use an asterisk there. What? They didn’t have room for those five words? The information the asterisk represents is the most important information on the page. Namely, that you are downloading a toolbar that gives you profile statistics about a website you don’t use, from a company you’ve never heard of, and that a google search doesn’t even provide useful information for. I’m guessing the feboz toolbar comes with a brand new trojan. Their way of saying thanks. In fact, the way they concealed the true purpose of the toolbar and snuck that information in at the bottom of the page is actually quite similar to how a trojan finds its way on to your computer. Kind of like people not knowing.